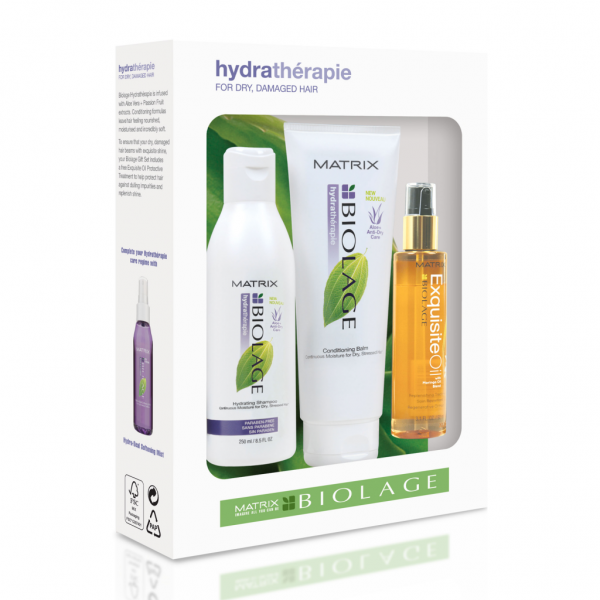 Product information "Matrix Biolage Hydratherapie Gift Set"
For dry and damaged hair that is in need of some serious tlc! Without the necessary treatment; dry hair becomes more fragile and damaged over time. Taking inspiration from the Rainforest’s ever-replenishing moisture cycle; Biolage Hydrathérapie continues to add moisture into the hair whilst the anti-dry care of Aloe and Passion fruit helps break the dehydration cycle. Gift set contains: hydrating shampoo (250 ml); hydrating conditioning balm (200 ml) and Exquisite Oil replenishing treatment (92 ml). Related links to "Matrix Biolage Hydratherapie Gift Set"
Customer evaluation for "Matrix Biolage Hydratherapie Gift Set"